Wreaths Across America to Celebrate 21 Years of Remembering, Honoring and Teaching With a "21-Day Salute"
COLUMBIA FALL, ME--(Marketwire - Nov 1, 2012) - December marks 21 years since Morrill Worcester and his family first delivered 5,000 Maine-made balsam wreaths to Arlington National Cemetery. Since then, their trip has become an annual tradition that today includes more than 800 locations across the country and overseas, tens of thousands of dedicated volunteers, hundreds of caring sponsors, and nearly 500,000 Maine-made wreaths. This year, in celebration of the service and dedication of so many, Wreaths Across America will share 21 days of stories that capture the essence of Wreaths Across America's mission to remember, honor and teach. Starting on Thursday, Nov. 1 and ending the day before Thanksgiving, our goal is to share the stories of those individuals and groups that have helped grow this organization to where it is today. We encourage you to follow our "21-Day Salute" on Facebook and Twitter (#21DaySalute), share our inspiring stories and contribute your own memories of how Wreaths Across America has impacted your life. Morrill Worcester, owner of Worcester Wreath Company of Harrington, Maine, was a 12-year-old paper boy for the Bangor Daily News when he won a trip to Washington, D.C. His first trip to our nation's capital was one he would never forget, and Arlington National Cemetery made an especially indelible impression on him. This experience followed him throughout his life and successful career in business, reminding him that his good fortune was due, in large part, to the values of this nation and the veterans who made the ultimate sacrifice for their country. In 1992, Worcester Wreath found themselves with a surplus of wreaths nearing the end of the holiday season. Remembering his boyhood experience at Arlington, Worcester realized he had an opportunity to honor our country's veterans. With the help of Maine Senator Olympia Snowe, arrangements were made for the wreaths to be placed at Arlington in one of the older sections of the cemetery -- a section that had been receiving fewer visitors with each passing year. Twenty-one years later, Morrill's 12-year-old grandson Duke is poised to carry on the tradition through Wreaths Across America. The organization has a goal to place a wreath at every headstone at Arlington National Cemetery, but they have a dream that people across the country will share the mission of WAA for generations. 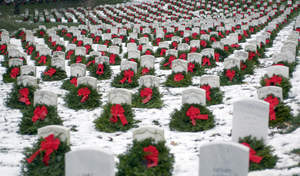 Remembrance wreaths placed at Arlington National Cemetery. Duke Slaven, grandson of Wreaths Across America founder Morrill Worcester, talking about the mission.